It's hard to deny that Pixar Animation Studios have an excellent track record in the film industry, having produced an abundance of top quality CGI animated films such as Toy Story (and it's sequels), Finding Nemo, Ratatouille, WALL-E and much more. 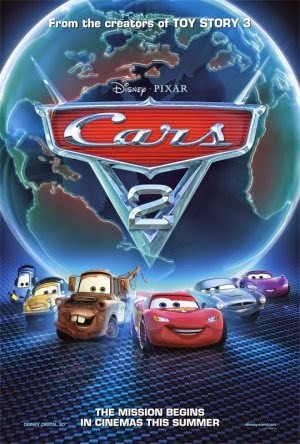 Despite not being necessarily known for it, they've recently been pinning their focus on sequels to some of their older hits, and whilst this worked brilliantly in 2010 with Toy Story 3, a beautifully animated and wonderfully satisfying conclusion to the trilogy, I'm afraid to say that this year's Cars 2 doesn't share such a success. The story revolves around Lightning McQueen (Owen Wilson) and his best friend Mater (Larry the Cable Guy) as they travel the globe during the World Grand Prix, which McQueen is determined to win. However, amongst all this, Mater learns of an evil mastermind who is violently sabotaging races worldwide, and inadvertently teams up with British spies Finn McMissile (Sir Michael Caine) and Holly Shiftwell (Emily Mortimer) in order to unmask this criminal and save the day. Being a Pixar film, it should be fairly obvious that the aesthetic side of things is top notch. Environments are truly wonderful to behold, with some being nicely modelled after real life landscapes, and character animation is incredibly fluid. It's not as colourful as some of Pixar's other flicks, but rest assured, everything looks great. The film is also viewable in 3D format, and to me this felt very conservative. The 3D isn't really that spectacular even during the action or racing sequences, and in all honesty I wouldn't recommend it. Whilst Cars 2 provides some pleasant eye candy, the story is where things fall a bit short. Granted, the story is by no means terrible, but when you remember that this is Pixar, everything seems a tad too unoriginal and predictable and there's a severe lack of development in some of the characters. Take Lightning McQueen; who, after being the central character of the original film and experiencing noticeable changes in his personality throughout, has been downgraded to a completely flat supporting character. That's right; Mater is the main character of this film (why the poster implies otherwise I have no idea), and whilst he's certainly a lot of fun, the film doesn't really enable you to relate to him that well and his comedic idiocy gets a bit old after a while. The story won't grab you, but the film is stuffed with a plethora of nicely animated Bond-esque action sequences and some intense racing scenes, and whilst these to get old after a while, they're still the highlights of the film by far. The voice cast of Cars 2 is pretty much the same as that of the past movie, but of course we have some new additions for certain new characters, most notably Sir Michael Caine who fits the character of Finn McMissile perfectly. He's English, so he's automatically awesome anyway, but the voice over he provides shows both the sophisticated yet earnest nature of the character. Mater is yet again comically voiced by Larry the Cable Guy, and as I previously said the character is pretty funny, but after a while his charm dies off and he descends into a pit of extreme annoyance. The rest of the voice cast perform nicely, especially Owen Wilson and Emily Mortimer who, alongside Caine, provide the best vocal performances in the film, at least in my opinion. As a standard animated film, Cars 2 is decent and, at times, a lot of fun. As a Pixar film, not to mention a follow up to Toy Story 3, it's very average. Not at all bad, mind. In fact, it's still an enjoyable film, but when it comes to the story and characters, everything just feels far too wooden and you'll be paying more attention to the action sequences than you will to the actual plot. If you really want to see the film, then by all means do so, but if you weren't very interested from the start, you should give it a miss.